Since Memorial Day is pretty much the unofficial official start to summer, I thought it would be fun to start posting some refreshing cocktails once a week or so. I thought about Boozy Tuesday or Winesday Wednesday but I decided to go with good ol’ Thirsty Thursday. Coincidentally, around these parts, Thursday is pretty much the unofficial official start to the weekend. Just one more day to get through, no big deal if you have to do it a bit hungover, right? I can’t promise I’ll have a recipe every Thursday but I will certainly try. 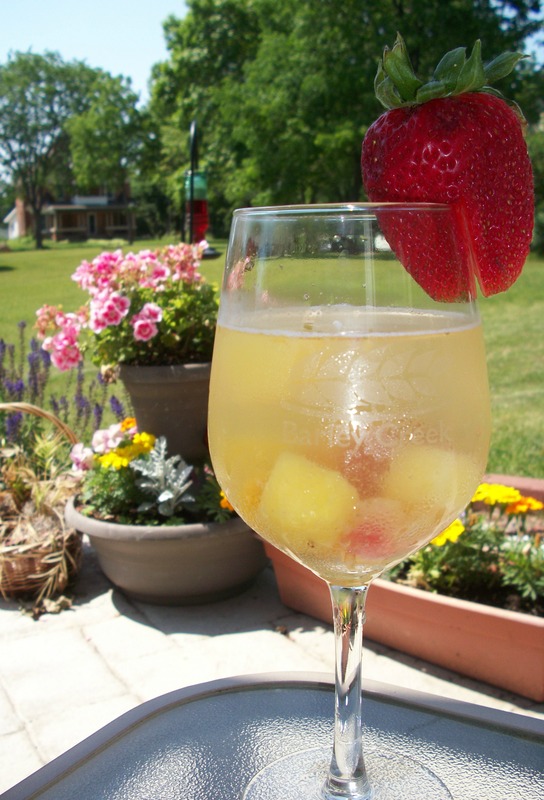 A summery, refreshing cocktail to start off your weekend juuuust right. 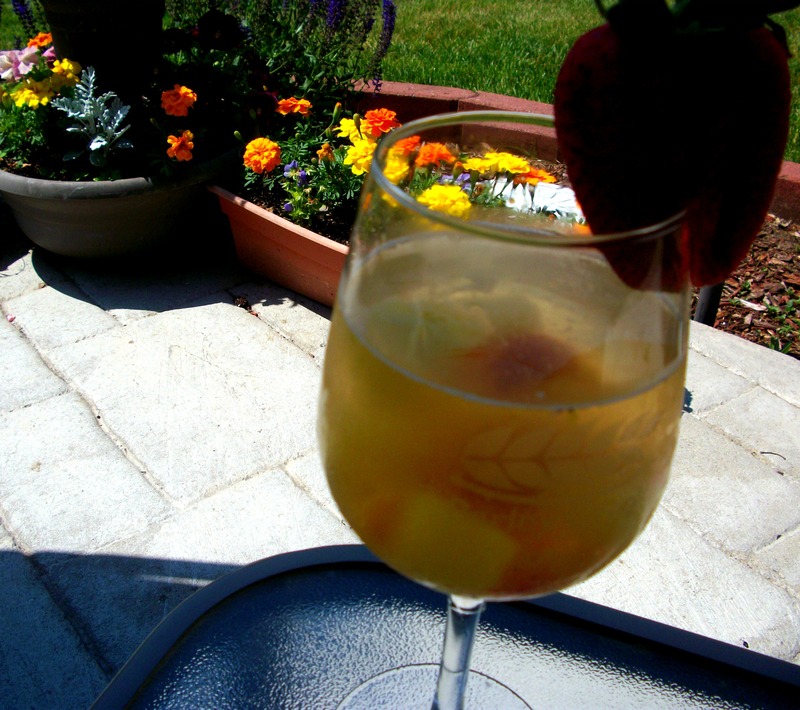 Just three ingredients is all it takes & you’re on your way to summery sipping pleasure. 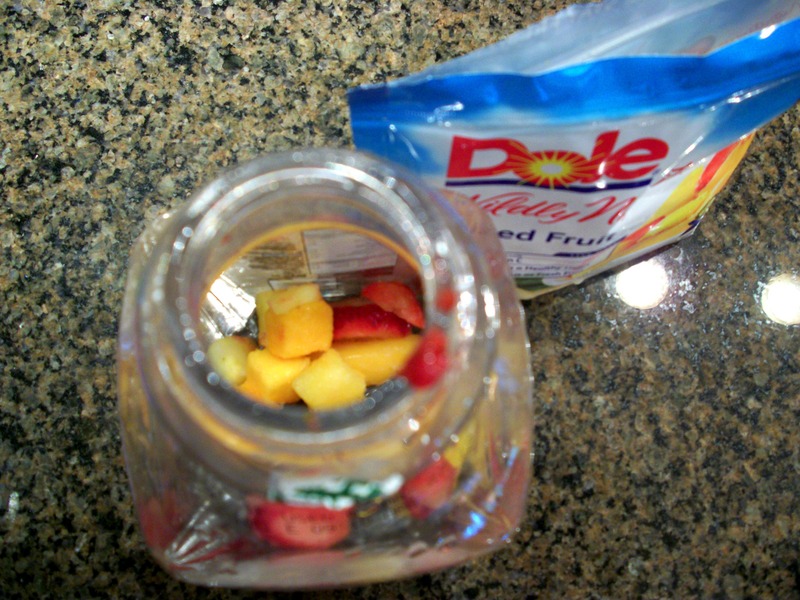 Start by placing half a bag of Dole frozen mixed fruit with pineapple, strawberries, mango & peaches in an empty pitcher (or, as shown here, an empty Simply Orange container 🙂 ). 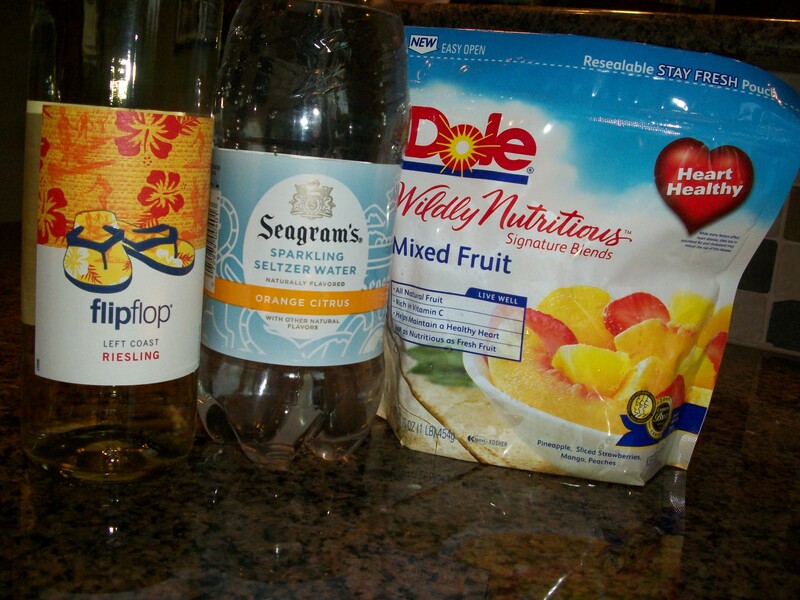 Next, add one bottle of white wine. 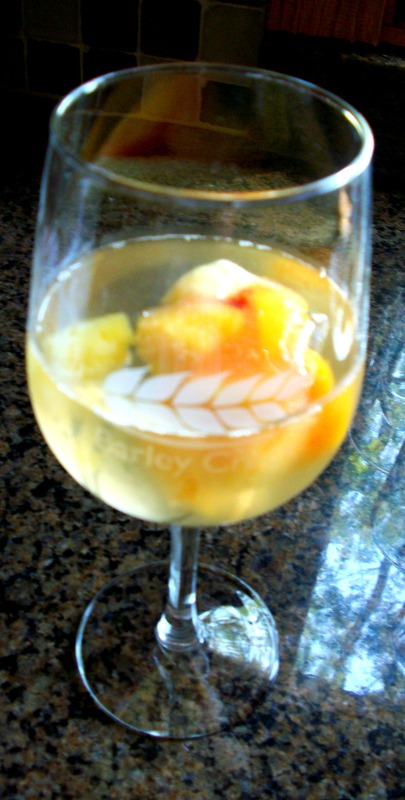 I used Flip Flop Riesling because of it’s peachy, tropical flavor. Kristin recently taught me that Flip Flop has an excellent description of each of their wines flavors, food pairings, etc. on the back of the bottle. How cool is that?! 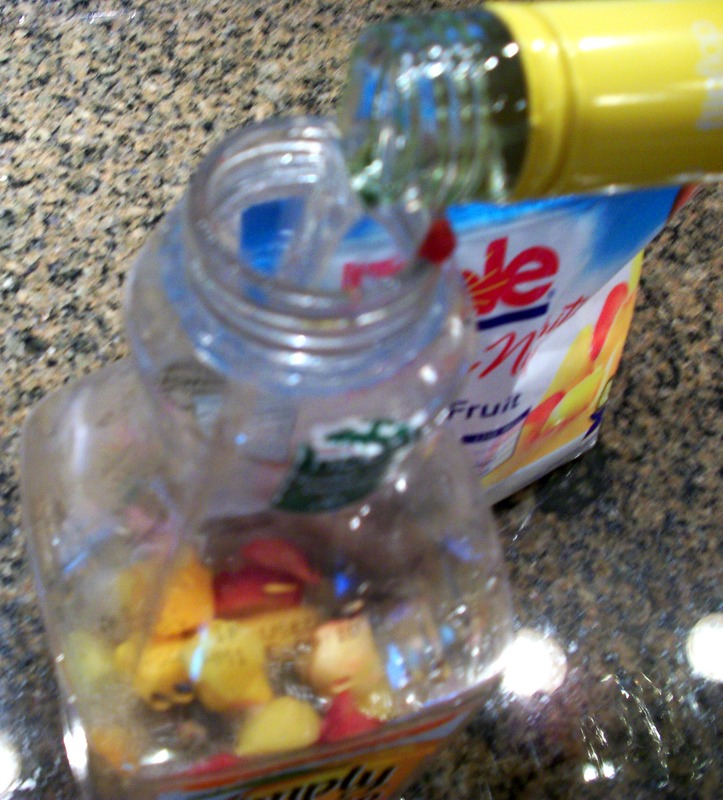 Next, place the fruit & wine filled pitcher orange juice bottle in the refrigerator and let it flavor up for a couple of hours. You don’t want it in there so long that the fruit starts to fall apart & get icky but you want it in long enough for the flavors to sort of meld together. 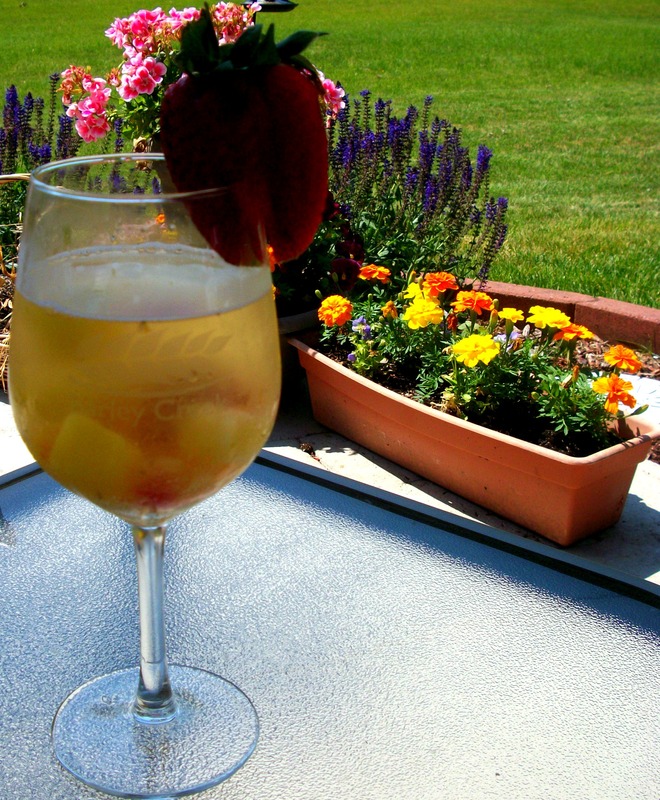 When you’re ready to drink, throw a few pieces of the remaining frozen fruit in a wine glass. This is your “ice”. 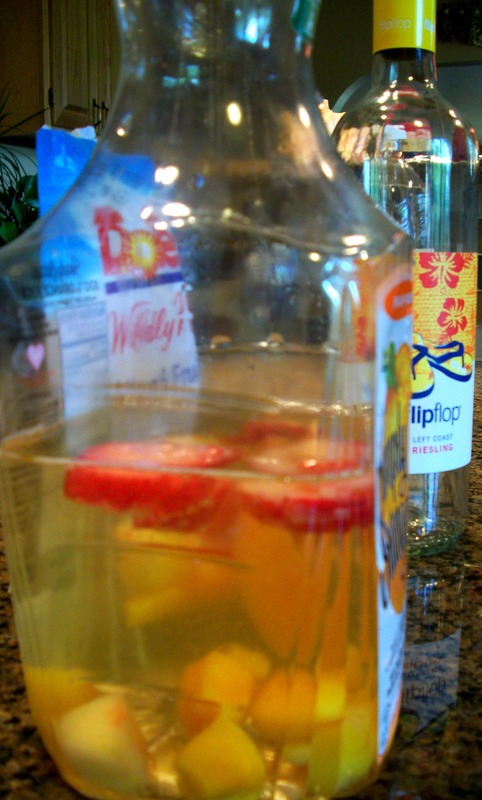 Pour in some of your fruity wine mixture and top it all off with some citrus flavored seltzer water. I used Seagram’s Orange Citrus flavor but I’m sure any other citrusy flavor would work fine. If you want it to be really sweet, you could replace the seltzer water with Sprite, but I was going for light & refreshing without being too sweet. Also, you can use whatever measurements feel right for you. If you’re sharing, use less wine mixture. 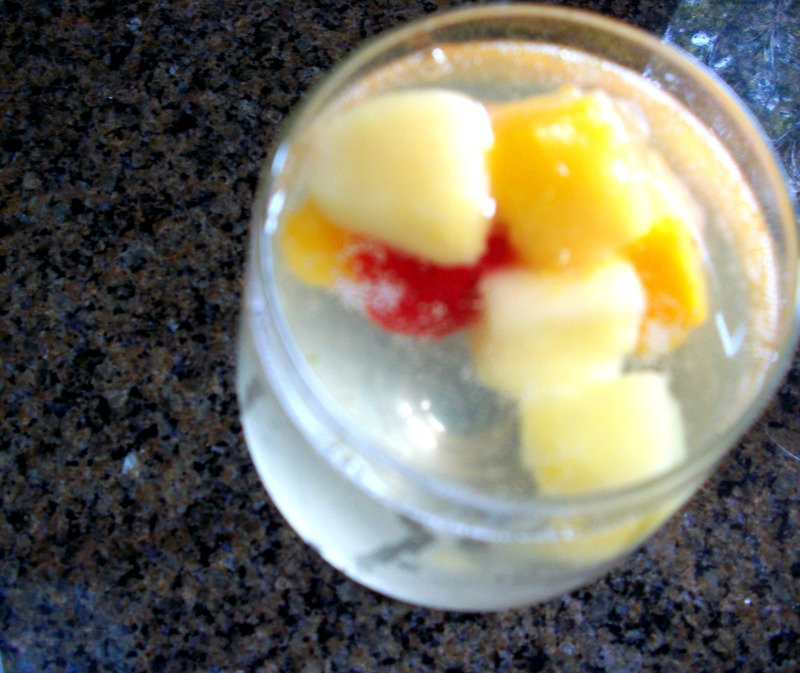 If you’re keeping it all for yourself, pour yourself a giant glass of the wine & add just a touch of seltzer. It’s your drink, make it how you want it!